A string quartet was among the very first works that Edvard Grieg presented after completing his studies in 1861, but the Quartet in G minor, op.27, was the only such work to be published in his lifetime. In 1878, while composing it, Grieg wrote that �it aims at breadth, to soar, and, above all, at vigorous sound�, and the amplitude of the sound is indeed striking: the generous use of double-stops creates an almost orchestral effect, unusual for the genre. This caused some reviewers to criticize the quartet as being unidiomatic, while others, including Liszt, greeted it with enthusiasm. Some thirty years later, when Jean Sibelius composed his D minor Quartet, op.56, he too had previous experience of writing for the medium, but op.56 is the only quartet among his mature works. The often used �nickname� Voces intimae is often taken to refer to the intimate interchange between the four voices in a quartet, but is probably a more specific allusion to a brief passage in the third movement: Sibelius wrote the remark into a score some time after the work had been published. 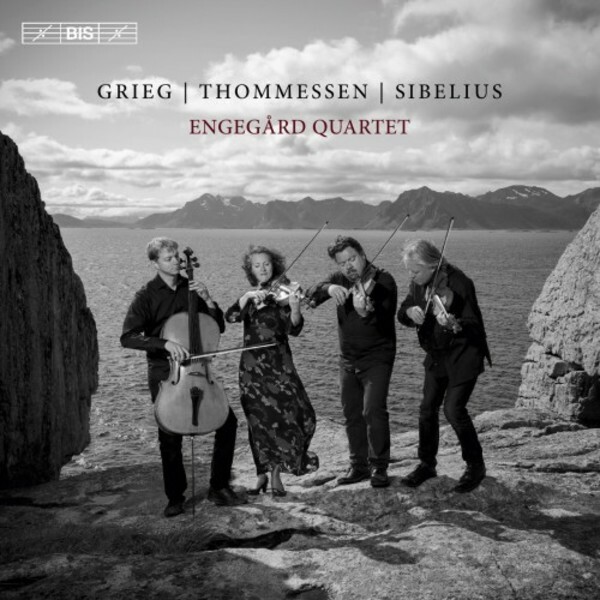 On its first release on BIS the Engeg�rd Quartet includes Felix Remix by Olav Anton Thommessen. The work, premi�red by the Engeg�rd Quartet in 2014, is based on the second movement, Allegro di molto, of Felix Mendelssohn�s String Quartet, op.44 no.2.